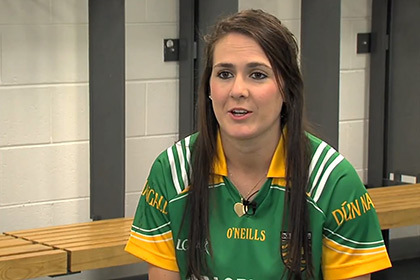 Donegal’s Katy Herron is proof that you can be a mother, work and play at the highest level with your county. Herron was guest on this week’s Sportsgirls Podcast and spoke about how she juggles being mother to Joshua, her job as a teacher and playing in Division 1 with Donegal. Joshua is no stranger to Donegal games and is certainly Katy’s number one fan. She gets him involved in her football which makes all the sacrifices worthwhile: “I know there’s days where you probably think you’ve too much on and Joshua probably suffers. More so than anybody else because I’m away training and stuff like that but when you have a family that supports you, he’s happy when he’s up here at mom’s. It makes it work. He comes to the games and he’s got a wee jersey with my number on the back. He gets involved too; it’s nice in that way. I want to make him proud.